Niagara-on-the-Lake is home to the Shaw Festival Theatre featuring the works of George Bernard Shaw, his contemporaries, or plays about his era. 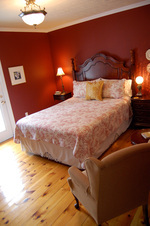 The Wine Country Bed & Breakfast is a fully restored twentieth century home situated in Old Town Niagara-on-the-Lake. Detailed moulded ceilings, wide plank pine floors and soft, rich colours and textures greet you as you enter our home. Our fireplace and comfy chairs are the perfect companions as you relax with a book or a glass of wine, you can also sit on our front verandah and enjoy the sunsets and our award winning garden. Our guest rooms are furnished with antique period pieces and each suite has an en-suite bathroom. The decor of each room shadows that of three different areas of Niagara-on-the-Lake. We invite you to click the Rooms tab at the top of our webpage to view photos and learn more about each room. Conveniently located two doors from the Pillar & Post Spa, our home is a short 10 minute stroll from historic Queen Street shops and the Shaw Theatres. 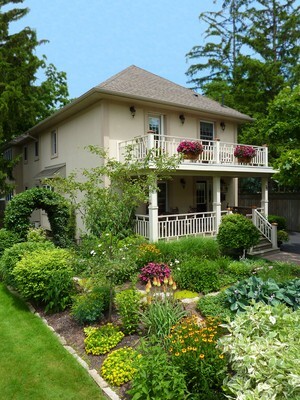 Catch-up on some much needed rest and relaxation at the Wine Country Bed & Breakfast in beautiful Niagara-on-the-Lake. A delicious hot breakfast served everyday. Steaming pot of hot coffee/tea, fresh fruit smoothie, homemade fresh fruit muffins, a variety of gourmet main course dishes as well as a sweet plate. We use local fresh produce in season.